Thursday we departed at 7:30 am for a 9 hour bus ride across the unpaved Denali Highway to reach the next lodge in Copper Center. I woke up early and took some pictures of the property as the sun rose and then went on a coffee run with the Hipster who is the brew snob of the crew and had researched a great local coffee shop, Black Bear Coffee House, across the street - definitely recommend it but its not an uber fast service so leave extra time. The bus ride was fairly non eventful, and with the exception of a few very rough bumps, not uncomfortable considering the road conditions. Most of us read or napped as much as we could. Throughout the trip, the Engineer has been keeping a tally of things we could have done better on our own, versus going through Princess. He was very thankful that he did not have to drive that road and instead got to sit back and enjoy the view. Halfway through, we stopped at the one place to get food along the whole route, the MacLaren Inn. They served a great lunch of sandwiches and chili, and their summer special dessert of wildberry pie and homemade vanilla ice cream. Along the ride, we learned about the tundra, and how the area was formed by glaciers, spotted some moose and caribou, and caught up on sleep. Arrived at the lodge around 4 pm and took some short walks before a nice dinner at the lodge. 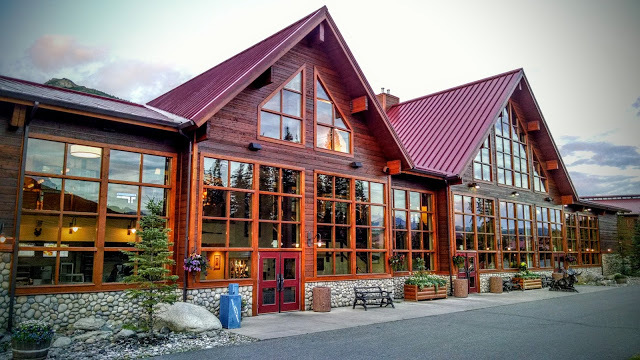 Since there is not much interesting to report about the bus trip, I wanted to share some information about Alaska and the lodges we have stayed at. It's also a chance to practice my recall so we can prepare for trivia on the ship. Alaska is the 49th state. The territory was purchased in 1867 for $7 million. It is the northernmost, easternmost, and westernmost state, since the Aleutian Islands cross the date line. We have learned a lot about the terrain. The tundra that we crossed yesterday on the bus is not arctic tundra covered in snow, but rather a mossy spongy top layer of the ground. Almost no trees grow on it, but there are lots of shrubs. It is favored by moose and caribou because they can see predators coming easily. Almost all of Alaska is permafrost, meaning that even in the summer only the first 2 feet of the ground thaw, so the trees all have very shallow roots that travel in a network underground. Because of that network and the air inside the roots, fires can smolder under the ice all winter and then pop up again once the top layer thaws. For the most part, they only try to control the fires if they are headed towards towns or the highway, otherwise they let them burn naturally. There are currently several fires in the Wrangell Mountains where we are now, and you can smell the smoke and see it hanging in the air when we stopped the bus. The tundra almost looks like the foggy cover around the Great Smoky Mountains near Georgia where I grew up, but it is actually smoke from the forest fires! There are so many edible plants here! On our ATV ride we saw and tasted something similar to a cranberry. Tom and I saw at least 10 different kinds of mushrooms on our hike in Denali. Blueberries and raspberries are also in season, but have not seen any bushes of them yet. Have enjoyed them in pies though! The lodges have all been very nice and on the rustic side. McKinley and Denali had a main lodge with a great room for sitting, coffee shop, restaurant, gift shop, bus stop, check in, etc. and the rooms were in separate building spread across the property. 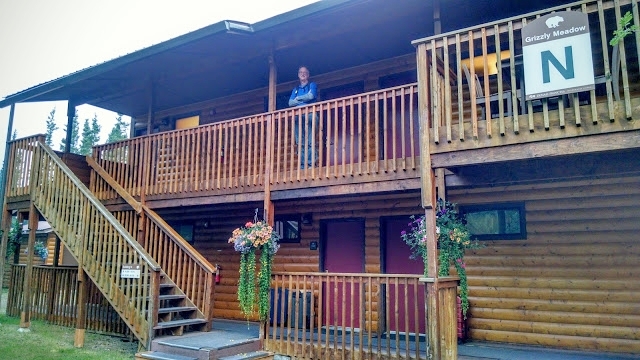 Copper River has a similar main lodge, but the rooms are upstairs in the lodge, like a hotel. It is also the smallest of the three we stayed at, with less than 100 rooms and only 2 places to eat. McKinley and Copper River had short hiking trails around the property. All three had nice decks or fire pits to sit out on and relax. The rooms all have blackout curtains which are greatly appreciated! Friday we are hiking, rafting, and fishing along the Copper River.